Off season rate is also available upon request. Monthly or Weekly or even a weekend! But towels are not provided. People can eat on the kitchen island. Dining table can seat 6 to 8 people. Three use table: pool, ping pong, and air hockey. Spectacular view and location. Unfortunately, property is a bit dated and could use maintenance. Spectacular view. Overall condition of house Is somewhat dated. Mix of strange decor from Asian to Beach to 80s. Owner responsive When ice machine was not working in refrigerator but did want us to pull the refrigerator out and try and fix it ourselves. Also there is junk under the deck which you can see from the fire pit. Is a comfortable house but not a luxurious house as the pictures depict. View makes up for it ! Also there are absolutely no towels of any kind. Not even in the kitchen so bring your own. Not even any pot holders. .
She tried to negotiate the price at the first place but he took it. When found ice maker did not work, I instructed her to restart the refrigerator but she refused and asked me to go there to fix it immediately because "We paid a lot of money". She has different opinion to the house decor and this is the first time that a renter said does not like the decor. So called junk under the deck are a few retaining wall blocks used to repair the ocean bank for next repairing and some surfing boards left by previous guests. "No towel" is mentioned in the listing and in the instructions sent to guests one week before their arrival. The reason is that many guests prefer to use their own towels. But we do provide them if guests request, especially if they fly in. I offered to reimburse her towle expenses but she said "don't worry about it". She left the house much messier than any other guests. One painting hook was damaged and the painting was on the floor. One king size bed and one twin size bed were peed, may be by her pets? But I did not deduct anything from her safety deposit, and further, mailed a check of $50, to make her happy. I can understand that she look down upon this house given that she did not get what she wanted on price at the first place. This was a great house! We had a large family and the house was perfect. We were unaware that towels were not included in the linens and the owner was very generous and reimbursed us for what we spent to buy them when we got there. He was absolutely great in answering all our questions as well. We were very happy with our stay and definitely recommend it for all others looking for a beach front house. Perfect for a large family or reunion...Convenient to historical events and to downtown. The home was perfect for our family with great space to accommodate everyone. Clean and neat when we arrived and easy to keep. Our only request to go back would be to make a stairway or ramp to the beach from the end of the current stairs. Just a great week with a 100% vote of 12 to go back. 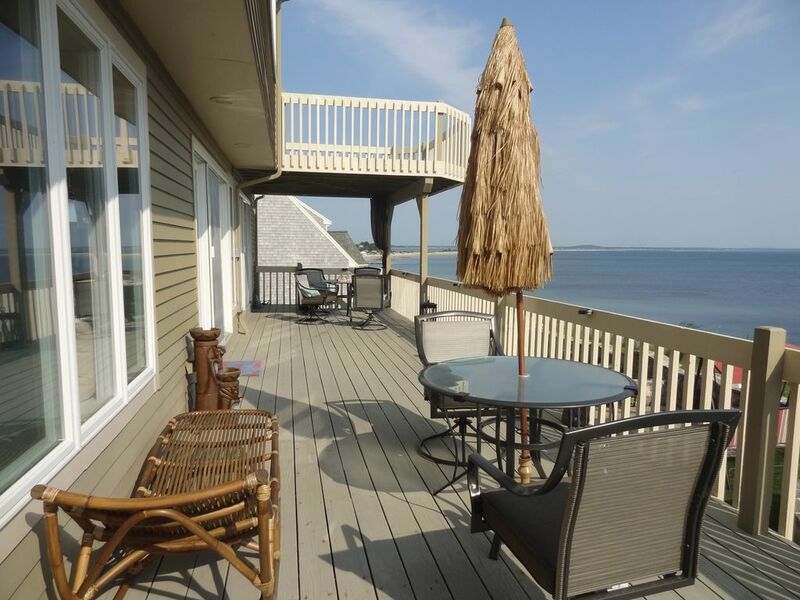 We chose this as our family vacation spot because of the location Off-Cape. After having enjoyed several couple vacations to Cape Cod, we wanted to have our families experience this wonderful place. Our daughters live in SC, FL and NC. We live in IN. So we set the date a year in advance to allow for vacation planning. Our grandchildren are 11-16, and are now old enough to appreciate the history of this area. After notifying Fred that there a few minor issues, he responded immediately to address our concerns; and offered to compensate for any inconveniences which were minor. The villa has everything a family would need to enjoy a great vacation. There is a soundproof game room for the kids to enjoy. The outdoor space is fantastic! We had a bonfire every evening; games at the large diningroom table, and thoroughly enjoyed our family time together! Appreciation for the eclectic decor was enhanced after a trip to the Sandwich Glass Museum. Those cases of beautiful glass fish are stunning! One afternoon we watched two whales cruise in the bay, and they actually breeched right in front of us! Our grandson captured this experience on video, as well as many other wonderful memories of this magical vacation! We unanimously agreed that this was our best family vaca ever! The only negative we had was the fact that the caretakers could be a little more aware of maintainiing the space. After all, when an owner lives thousands of miles away, they have to trust that the job is being done properly. Plymouth is 3 miles away, there are 2 public beaches nearby, fishing boats to watch everyday; and the weather was perfect! A very memorable stay for our family! Glad that you had the "best family vaca ever" in the house! Thanks for your comments. Beautiful views from nearly every room! This large and lovely house was home to eleven adult family members and a toddler. There was space for all of us to come together and space to be alone as well. Fred even managed to provide a crib for the little one. We enjoyed the gorgeous views and beautiful sunrises as well as sitting around the fire pit. The kitchen island was also a favorite gathering place for conversations and lots of laughter. The gameroom also was well used! The location is convenient to Plymouth and Plimouth Plantation. We thoroughly enjoyed our week here. Thanks! Feel good that you enjoyed the house! This Plymouth, MA property has incredible potential. The location and size of lot and house are just what you would want for a family gathering. The unfortunate realization is the property upkeep (both inside and out) lacks attention. There are several 'non-disclosed' details the owner should mention before finalization of rental. (neighbors, beach access, drive way caution). Of particular importance, is the exiting (auto) from the property onto Warren Avenue. The well groomed neighbor's hedges are a bit 'grown out' making it very difficult to exit the drive way. Use extremely caution as cars come quite fast around the bend! The landscaping needs attention as it takes away from the ocean view when gathered around the fire pit. There are stairs that lead down (partially) to the beach that need to be cleared of the overgrown grass. This grass makes the decent down to the landing difficult. Once on the landing you are on your own the remainder of the way down. While it is possible to climb the rocks both up and down, caution must be used. No small children! There is also an abundance of broken outdoor furniture strewn under the large deck that really distracts from the property's beauty. The deck could also be cleared of the many old spider webs along its length. Inside the house, there are numerous lightbulbs out, light switches and wall sockets that do not work, ceiling fans with very short pull chains which require standing on chairs to adjust. If you are a light sleeper, the fan on the lower level will keep you awake when placed on a low or medium. The kitchen sink faucet is extremely difficult to swivel and the faucet doesn't really stay in its base. Trash cans are extremely small (kitchen and bathrooms) requiring constant emptying and there are no separate recycling barrels. Owner's instructions are to 'put recycling to the side'. What does this mean? This property's location is ideal for going into Plymouth for its many treasures. Blue Blinds Baker (fresh breads baked daily), Plymouth Rock, and Anna's Harborside Grille to name a few. For me, just a bit more effort and attention on the part of the owner would make this a 5 star vacation home. Well, the review is not very accurate. The words like "very", "extremely", "numerous"...all exaggerated real situations. I offered to go to the house and solve the issues right way but they declined. In the contract and instructions, there are disclosures of attentions and cautions guests should know about. Sight-seeing: Mayflower Ship, Plimoth Plantation National Park, also easy to get to Cape, P-town and Martha's Vineyard.